Dieter Rams, pictured on left. With Braun Stereo System Combination in background. Designed by Hans Gugelot and Dieter Rams, 1958. More vintage electronics from Braun and other brands can be found when you click on the labels on the bottom of this post. Some more minimal industrial design icons from Braun. Most designed by Dieter Rams, Hans Gugelot and Dietrich Lubs in Germany between the 1950's and late 1970's. All these products are unfortunately no longer available. Braun was bought by Gillette and subsequently taken over by Proctor & Gamble. Proctor & Gamble phased out the entire Braun line in 2005. Gerrit Terstiege: Mr Rams, as you look back, do you now regret that when you worked as a designer, computers weren't able to do all the things that they can do now? 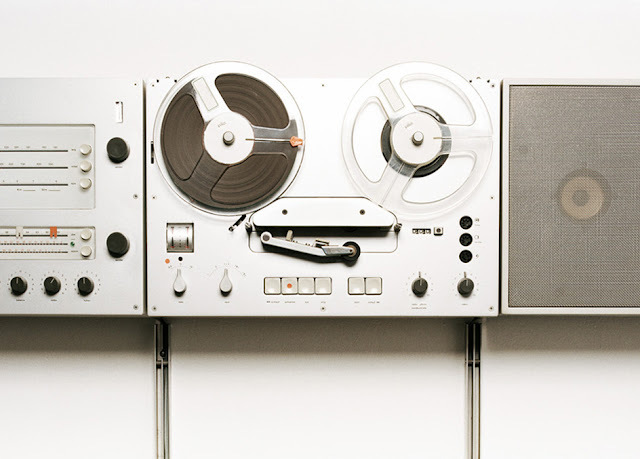 Dieter Rams: Yes – and no. Yes, inasmuch as computers make networking so much easier. But there's often a lot of fooling around with computer renderings and it's wonderfully easy to gloss over any problem areas. I have always detested them and fought against them. Most of my drawings and sketches were intuitively true to scale and with all abstractions were able to be converted from the modelling without any problems. They may well have been less exact but they did show exactly what I wanted. I have worked a lot with sketches. GT: How did you actually discover your particular style of drawing? DR: I had a good drawing teacher at the Werkkunstschule in Wiesbaden, called Mr. Rotfuchs. He was a lecturer in illustration and as we were prospective architects our routine regularly included figure drawings. When I began to shade in areas using fine parallel lines – something that everyone does who starts freehand drawing – Mr. Rotfuchs said to me: "Stop that nonsense. Just draw the line a bit thicker and you will get three-dimensionality too!" Basically, my manner of representation is based on simple line drawing. GT: New products usually involve teamwork because design and technology ultimately have to go hand in hand. How was the development process structured at Braun when you were in charge? How did you go about finding a new form for a particular item? DR: If I think of my earlier years at Braun, which was during the mid fifties, I can recall many problems that arose out of a lack of cooperation between designers and technicians. Back then, the forms and possibilities of working together still had to be explored and developed. DR: When Hans Gugelot of the Ulm School of Design was at the Braun works in Frankfurt he talked to brothers Erwin and Arthur Braun, who owned the business and who, along with Dr. Eichler, were responsible for strategic design. So Gugelot's discussions were at a level that had nothing to do with the technical side of product development. This could only go well as long as they were merely discussing redesign – new shells for existing technology. But, as we know, this was not what Gugelot had in mind – he wanted to follow a different path altogether. He was unhappy about the fact that the first items he reworked were more promising on the outside than they were on the inside. This deficiency simply had to be rectified. Erwin Braun quickly came to the conclusion that at Braun design had to be done in-house! GT: And then, in 1955, your time came as it were – for in the beginning you weren't appointed as a designer but as an architect. DR: That's correct. One of my first jobs in the design department was to harmonise the relationship between the designers and the technicians and so build up trust. There was certainly no form to the design process; for example, as yet there were no briefings. Later on we created teams consisting of designers, marketing people and technicians who, from the start, all worked together on a product. Such a framework does have a huge effect on the design process. The design projects then followed the tasks set by each of the individual areas – whether it be hi-fi, body care, health care etc. There was a business director who was at the same level as the technical director and the design director. Thank goodness I was the only one who reported directly to the chairman of the board. This gave me a boost. GT: When did this type of structure become firmly established at Braun? DR: It happened during the seventies. The steadily increasing sales meant that we had to design products for international markets and this involved working on several products at the same time. One could say that globalisation started very early at Braun. And also because of the assistance we got from Gillette AG, which Braun had taken over in 1967. GT: Was there any product which really gave you headaches during the development stages? DR: Oh yes, the Atelier stereo system that Braun offered as the "Last Edition" and which heralded the end of the hi-fi era was one of these without a doubt. On several occasions I visited Japan with our technicians because Japanese firms were putting the insides into the components. The tuner came from one firm, the amplifier from another and yet another company provided the technology for the record player. Luckily they were all in Tokyo but I couldn't imagine how everything would fit together at the finish. Some of the Japanese firms in turn even had parts produced in Singapore, which didn't make things any easier. But, in the end it did all come together. GT: And in the mid-fifties when Braun design was born, did you just straightaway start designing something? DR: Not quite. However, in those years Braun simply didn't have a development process that anyone could understand. A lot of things were done for emotional reasons and based on particular circumstances at the time, while keeping the firm's production capabilities etcetera in mind. And then an idea would crop up here and other one there. Personally, I always greatly appreciated it when I did come across a technical innovation. GT: It is surprising to hear you use the word "emotional" in this context. How then was the decision made to develop such a complex and expensive piece of equipment as the World Receiver T 1000 during the early sixties? That was surely no gut decision. DR: On one hand the first small portable radios quickly became the object of competition. The Japanese rapidly adapted transistor technology and then put similar small appliances on the market. We couldn't keep up with them. However, on the other hand transistor technology offered opportunities that we wanted to take. So we decided that we'd make a world receiver of such quality and makeup so as to be harder to copy. Such considerations certainly did play a part – but just not the strategies of the marketing team. By the way, when at the end of the seventies the marketing team at Olivetti got the upper hand, Ettore Sottsass left the company and addressed himself to free designing and experimentation, which then resulted in the formation of Memphis. But doing this was easier for him as he was never a permanent employee at Olivetti. It was different with me. You could also say that I just approached things differently. GT: At that time, in around 1980, you had been employed there for 25 years and as head of design you managed a large team. It would have been unthinkable for you to have suddenly walked away to begin painting vases for exhibition in galleries ... 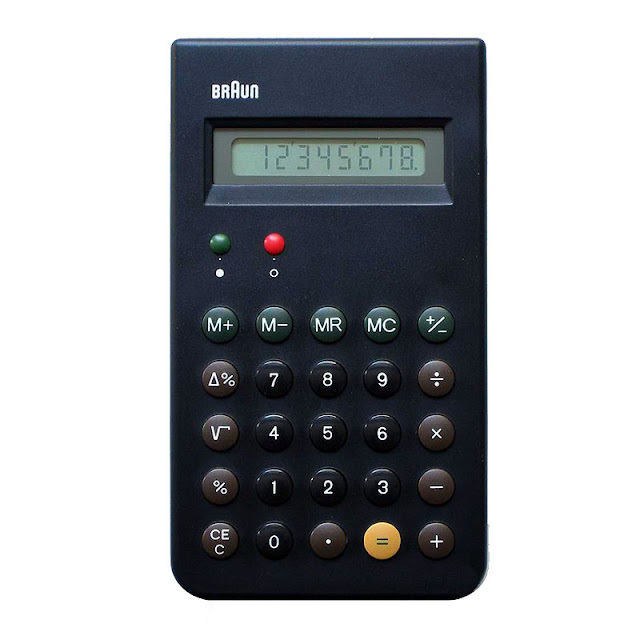 However, how was it actually possible for marketing to have become so important at Braun? After all, you and your design team showed that you could develop outstanding products even without any input from marketing. DR: This always had to do with the ever-increasing quantities that had to be produced. And with the fact that more complex production technology also necessitated huge investments in toolmaking and production facilities. Marketing gained in importance at the end of the seventies as it was responsible for ensuring competitiveness and a return on investment. GT: You began to watch your competitors more closely. DR: Not only that, but design and technical innovations suddenly became more difficult as they always carry risks and these especially include economic risks. At a certain point fully automated production became essential as we couldn't produce sufficient quantities without it. Such extensive production lines were masterpieces in themselves but they now required so much investment that we had to ask ourselves when we would get the money back that we were putting into any particular facility. This meant that the firm became less and less willing to risk giving new ideas the green light. 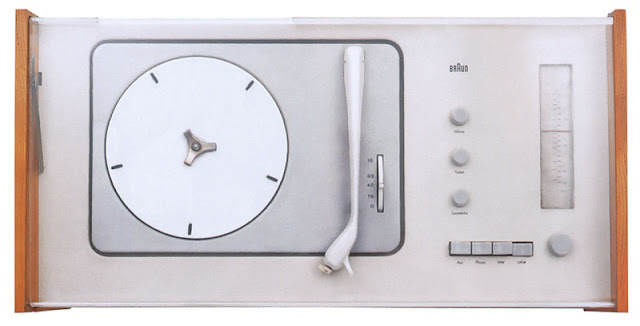 GT: In recent years a large number of photos and drawings of Braun products have come to light that were never produced. For example, it was only decades later that we heard that during the early sixties someone in the firm had thought about making a portable television with a shape related to that of the T1000. Why was this never carried out? DR: Even back then we believed that we'd not be able to sell enough television sets that small. Brionvega and others later proved that portable TVs can be very successfully marketed. But the reason for the actual problem may be that no one wants to admit that at some point they have reached the end of the line. Yet you can't always be making a new shaver or a new coffee machine unless you come up with a real innovation – and here I'm not talking about tinkering with the shape or the colour. And then people think that this will increase sales a bit more. They're dreaming! Yet for all this it seems as if most managers still believe that just having a sheer mass of products on the market achieves something. Right now, that is the problem with the car industry. They have been shoving more and more cars onto the market yet it is obvious that the markets have long been saturated. And yet these are precisely the development programme targets being set by the design divisions of larger companies. But I still maintain that the way is to produce less, but better. Dieter Rams, born in Wiesbaden in 1932, was Braun's head designer from 1961 to 1995. His many outstanding designs have influenced generations of designers and have been recognised in many exhibitions and publications. He lives in Kronberg / Taunus.